In 2013 I was diagnosed with cancer and our whole world fell apart. Thankfully, with treatment at the Bristol Oncology Centre, I was able to beat it and now have regular check ups and am on a program called living with cancer. Throughout my treatment, I maintained a very positive mental attitude, during the cancer treatment I looked for things with a positive message to share. My family and friends liked the messages I would share on Facebook- they could relate to it, and it really gave me a good feeling to know I was helping people. I’ve even had people say thank you to me- it helps! This December I will turn 60, and to celebrate this milestone, I set about taking on 60 sponsored events to raise money for the Above & Beyond and the BHOC. Currently I am on 39 events, which has included the DB Max Westonbirt Triathlon, a number of 5K Park Runs, flying a plane, a mixed hockey match, mixed netball match , Pirate day in Bristol, walking the yard arm on the SS Great Britain, a VIP Tour of Bristol Old Vic, the Bristol 10k, an interview about PMA 60 Events for 60 Year events & Above & Beyond on BCFM Radio 93.2, and a charity golf day. My criterion for an event is “anything out of the ordinary”. When I took part in the DB Max event in Portishead that was events 41-42-43. My wife Jayne has been right behind him, and on occasions even right by my side, having also taken part in one of the races. She thinks I am mad but she is supporting me 100%!”Also We want to give back to those that gave to us when we needed it. To celebrate my 60th birthday I am having a big Garden Party at Keynsham Rugby Club was an open event with bouncy castle for adults and children face painting, nail painting, food and music. In September the pace continues with the Chew Valley Fest, a great festival weekend of food, music and camping, where Above & Beyond are one of the supported charities. I am involved with a charity boxing match on 10th September. The 60 events will culminate in December with the Weston Christmas Cracker, an annual 10km race in the seaside town of Weston Super-Mare. Above & Beyond have been really supportive the whole way, providing me with fundraising materials and t-shirts, messages of good luck, support at some of the events and generally just spurring me along. 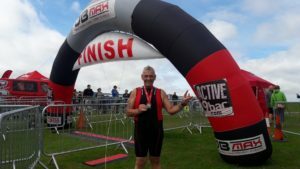 PMA is now a way of life hence why I was doing the DB Max event in Portishead, & I cannot wait to do the DB Max Westonbrit Triathlon one again, that event was one of my highlights of events this year.